There is a feature that has been in Microsoft Dynamics GP since version 1 that you probably forgot about. .. These are fake accounts, nothing ever gets posted there, but they can save you time. To continue with this week’s topic on making mistakes, use the correct feature to fix a Microsoft Dynamics GP GL entry. 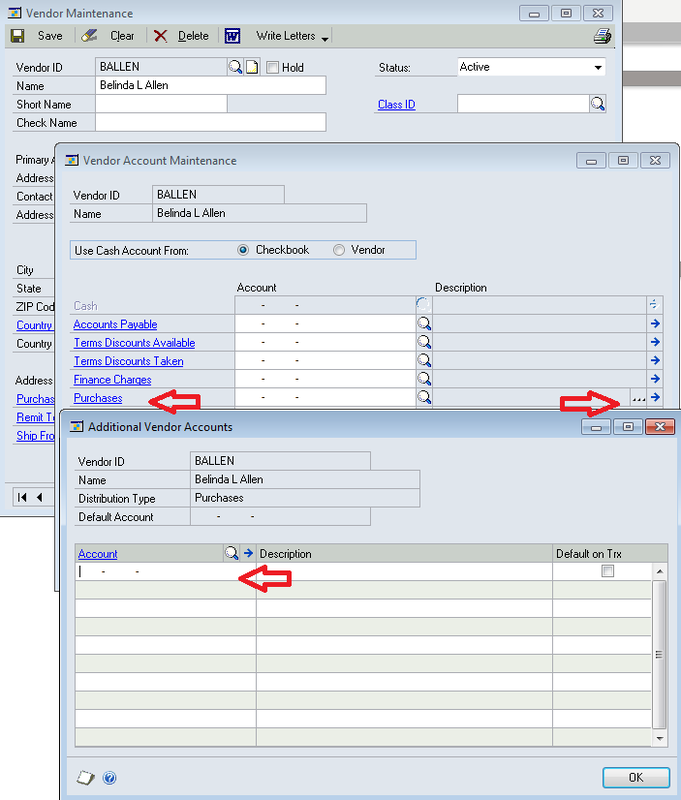 Use default Microsoft Dynamics GP GL accounts with Vendors to make entering distributions easier in Payables. If you are not currently doing this, you are wasting time. Author Belinda AllenPosted on April 10, 2019 April 10, 2019 Categories GP Financials, Microsoft Dynamics GPLeave a comment on Default Distributions in Microsoft Dynamics GP Payables? Author Belinda AllenPosted on April 8, 2019 Categories Microsoft Dynamics GPLeave a comment on Made a mistake in Microsoft Dynamics GP? This video shows a new feature of GP2010 R2, emailing reports directly from Microsoft Dynamics GP. It’s fast and simple. Here I am sending out an Aged Trial Balance with Options from Microsoft Dynamics GP Payables Management. In this Video I show how to maintain Budget Transaction History, Enter Budget Transactions and how I use multiple Microsoft Dynamics GP Budgets in FRx (although it could be Management Reporter, Jet Reports, or any financial reporting tool).